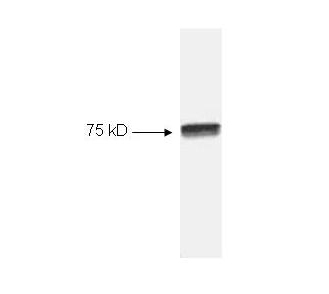 NFKB p65 antibody LS-C18904 is an unconjugated rabbit polyclonal antibody to human NFKB p65 (RELA). Validated for ELISA, IP and WB. NFkB cRel peptide corresponding to a region near the C-terminus of the human protein conjugated to Keyhole Limpet Hemocyanin (KLH). Suitable for immunoprecipitation, immunoblotting, ELISA and supershift assays. This product was assayed by immunoblot and found to be reactive against NFxB cRel at a dilution of 1:1000 followed by reaction with Peroxidase conjugated Affinity Purified anti-Rabbit IgG [H&L] (Goat). Anti-NF?B cRel is suitable for the detection by immunoblot of human NF?B cRel. No reaction was observed against the analogous Mouse protein. This product was also tested in a gel supershift assay and found to be reactive against all cRel containing human NF?B complexes using 0.5 to 1.0 ?l per assay. Optimal titers for other applications should be determined by the researcher. Western blot of HeLa cell extract. All incubations except color development were performed using TBS supplemented with 0.1% Tween-20 at room temperature. The membrane was blocked in 5% dry milk for 2 h. After washing, a:1:1000 dilution of the primary antibody was added to the membrane and incubated for 2 h. Washes with buffer were performed 4 times for 5' each. The western blot was incubated with secondary antibody (HRP Goat-a-Rabbit IgG [H&L]) diluted 1:2000 for 1 h. Washes with TBS preceded color development. Western Blot of HeLa cell extract using anti-NFKB cRel at a dilution of 1:1000.